Giada was on the Today Show last week sharing some Labor Day grilling tips and recipes, and she shared this recipe for Italian S'mores. I have been craving some s'mores lately, and my Mom has been wanting to try Nutella, so I just knew we had to make these. Now please note we did things a little differently than Giada but you can find her original recipe here. She used a baguette instead of a graham cracker, but we had graham crackers on hand so that is what we used. I still call them Italian S'mores because they use Nutella instead of a chocolate bar. I then recreated the recipe again when I got home using gluten free graham crackers. You can also either roast the marshmallows over the flames in your grill, or you can roast them under the broiler as I have done below. My Mom did find us some fun skewers to roast marshmallows, so I do need to try those out, but it was too cold and dark out when I tried these at home, so I just made them under the broiler. Spread a little (or a lot) of Nutella onto one graham cracker square. Make sure to lick your knife clean =) Roast your marshmallow (either the old fashioned way or under the broiler). 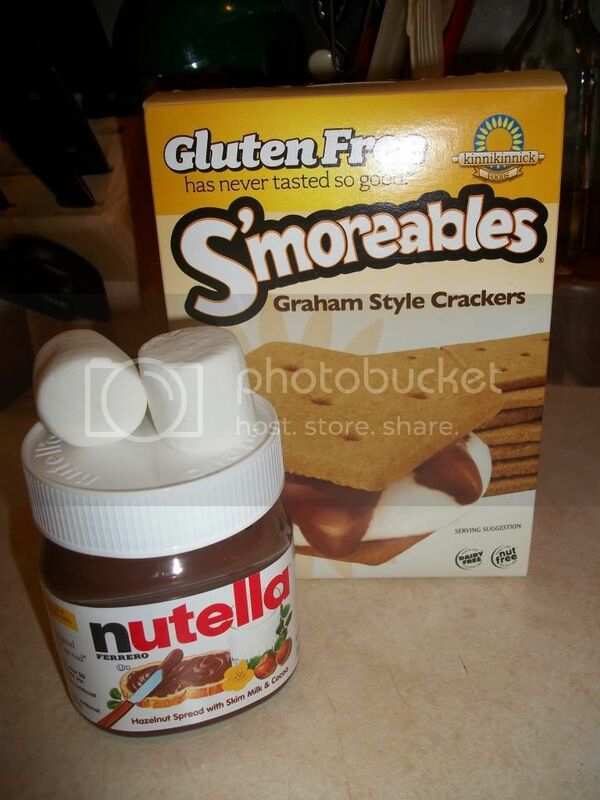 Place roasted marshmallow on top of the graham cracker with Nutella. Eat immediatly for be results. Repeat as needed. To broil your marshmallows, I placed a piece of foil on a baking sheet and then sprayed some cooking spray just so I could ensure the marshmallow would not stick. Then place under the broiler and watch very carefully. As the top starts to turn brown, pull the baking sheet out of the oven and flip the marshmallow over. 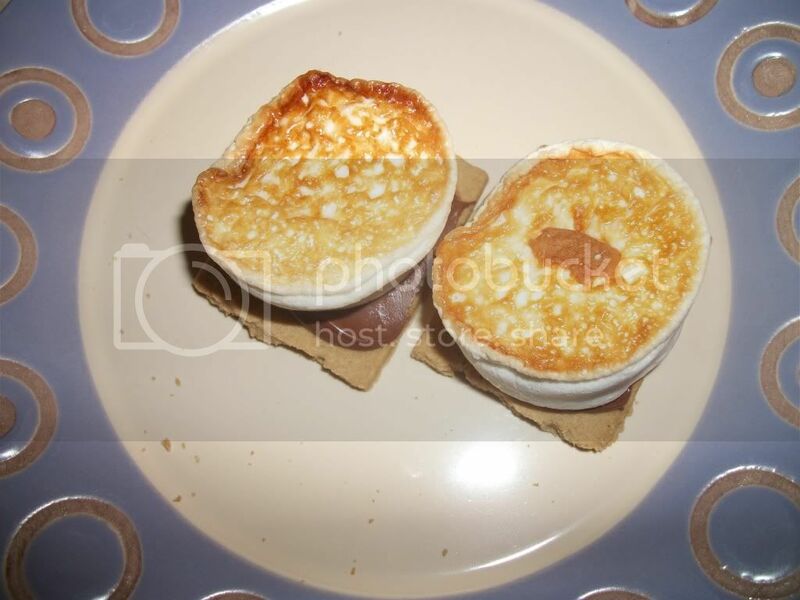 Then put back under the broiler until the other side becomes brown and the marshmallow starts to puff up. Please note the gluten free graham crackers in the above picture are not too bad. They are a little harder than typical graham crackers, but they taste just like the honey flavored graham crackers. They remind you of a hard cookie you would dunk in your coffee. I would recommend trying them out if you are trying to go the gluten free route. ***Update: Since I have made this recipe about a hundred times this week (I am obsessed), I have discovered some tricks with broiling the marshmallows. If you have a custom temp setting on your broiler, set it on the higher temp (around 300 degrees). This will allow your marshmallows to brown quickly, and not get too puffy and mushy. Please note that they will brown quickly, so please keep constant watch on them, and as soon as they start to turn brown, take them out and turn them over. If you broil them at too low a temperature, they will just melt and get gooey and won't brown. 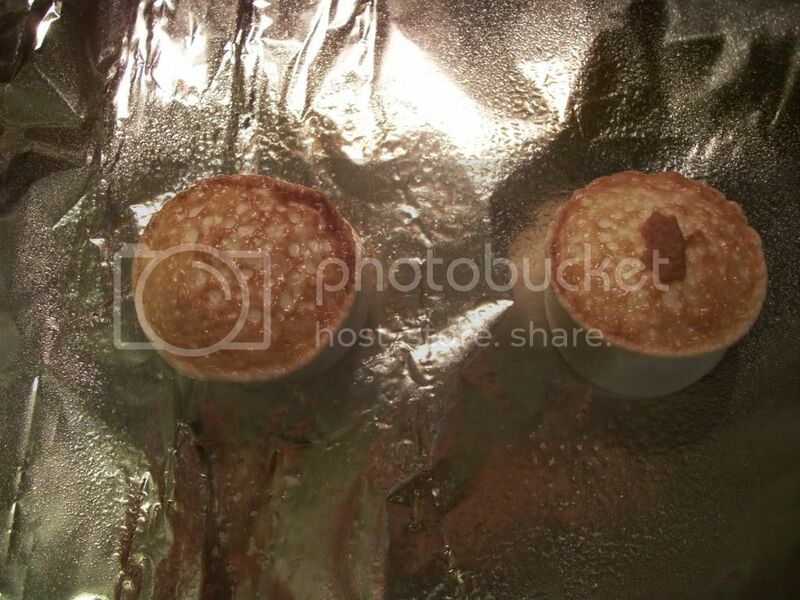 They will also get really sticky, and will stick to the foil/pan and to everything else, and that's not fun. I also read on a Nutella recipe website that you could use marshmallow fluff. You won't get the campfire taste, but it would work in a pinch. Yum -- this sounds like a delicious twist on one of my favorites! I discovered nutella instead of a chocolate bar earlier this year in either January or November. IT changed my life. I definitely am a fan of ROASTED and not burnt marshmallow so I will have to attempt the broiler trick. This is a neat idea since we've begun keeping Nutella in our pantry all the time. And, we try not to keep chocolate bars around, you know. So, we could do this broiler trick with the Nutella most anytime and --- we would only have to fix two. (ha!ha!) Again, this is a neat idea!!! Hey, Jen, saw a recipe for chocolate pancakes on the Betty Crocker site that uses Nutrella. Spread about 1/4 cup pancake batter on griddle and drop 1/2 teaspoon of Nutrella in center before covering with a small amount of batter. Cook until browned on both sides. Now you have chocolate-stuffed pancakes.